As researchers and education leaders parse over Idaho’s teacher salary rankings, a recent study looks at the issue from a different angle. One not-so-surprising takeaway: Salaries matter, as high school students decide whether to consider the teaching profession. In 2017, only 5 percent of students said they plan to major in education. As recently as 2008, education was the third most popular major for test-takers; for the past few years, it has ranked eighth. When asked why they were interested in teaching, students said they enjoyed working with children and young people, wanted to make a difference in their community, or were inspired by their own teachers. When asked why they had ruled out teaching, nearly two-thirds of students cited pay as one of their top concerns. Students also said teaching provided limited opportunity for career advancement, or said they didn’t think they’d be good at teaching. “By far, the biggest challenge for teacher recruitment is starting salary,” researchers said in their report. And surveys indicated that it would take starting salaries of $50,000 or more to get large numbers of students to take a second look at the profession. 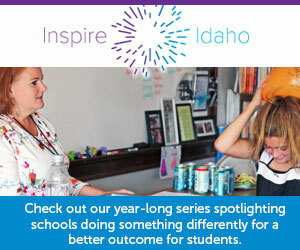 Idaho’s current minimum teacher salary is $35,800. Students who were “potentially” interested in teaching fared better on the ACT than students who were “definitely” interested in teaching. However, researchers said that more than 40 percent of would-be teachers met at least one college-ready benchmark on the four-part ACT. “We are not suggesting that all students planning to become teachers are academically unprepared,” the report says. The signing was a formality, and hardly unexpected. The spending bill bankrolls the plan to increase minimum teacher salaries to $40,000 over the next two years. Gov. Little has changed his salary proposal since January’s State of the State address. However, lawmakers will have to make several key decisions on teacher pay in the next few weeks.